Every Monday, we tap GOLF’s Top 100 Teachers in America for their insights on what went down between the ropes over the weekend on the major Tours, and more important, how you can use this information to improve your own game. Call it trickle-down tips — learn from the best to play your best. 1. Wesley Bryan shot a final round of 67 to claim his first PGA Tour win at Harbour Town, a course famous for its narrow fairways and demanding tee shots. Bryan showed some serious mettle down the stretch, playing the final six holes in two under par. What do you do when you absolutely HAVE to hit the fairway? 1. If a player is hooking the driver, adjust the right hand grip to a more neutral alignment (more on the side of the grip than under, with the thumb pointed down the top of the shaft). 2. If a player is slicing more than desired, adjust the left hand more on top (palm to the ground and thumb on the right side of the shaft). These in-round adjustments will help fix the flight and keep the ball in play. By establishing a dominant shot shape and neutralizing excessive side spin, players can find the fairway. A typical course fairway is 30-40 yards wide. I coach players to determine the width of a fairway on the range and train by hitting as many drives into that space as possible. Another thought for hitting the fairway: Stick with using the driver. I have seen lots of players take out a fairway wood or hybrid to keep the ball in play when they doubt their driver. This is a good idea only if they practice this option and hit these clubs a very long distance. Most players have hit many more drivers in their practice sessions than 3-woods off the tee, so making a tentative swing with a rarely used club is a recipe for disaster. Brady Riggs, Woodley Lakes G.C., Van Nuys, Calif. (@BradyRiggs): The biggest key to executing a tough tee shot under the gun is to stay committed to the shot at hand. Choose the shot shape you have the most confidence in, visualize the starting line, where it will land and how it will roll. Stay true to your pre-shot routine and let it go. Many amateurs waste the opportunity for success by thinking about what they don't want to happen, which is a guaranteed loser under pressure. Brian Manzella, Brian Manzella Golf Academy (@brianmanzella): You have to go with your stock shot. If it's a cut, make sure to open up enough and have your hands where they need to be at impact to have the face open enough. If it's a draw, take extra care to get your arms swinging before your body tugs on your lead arm too much in transition. BUT—the real trick is making sure you don't over-cook your curve. Faders need to make enough turn going back and drawers need to keep unwinding through the shot. -Grip down one to two fingers' width for more control over the club. -Use a slightly narrower stance to encourage a more centered swing. -Use your normal swing tempo. Under pressure, we tend to get quick off the ball or swing too easy in the downswing trying to control the ball. Brian Mogg, Brian Mogg Golf Academy (@MoggAcademy): When you absolutely have to hit the fairway, narrow your focus to the smallest target or object you can find. You have to be specific in your mind for what you're aiming for and committing to. Fairways are usually 35-40 yards wide, and there is plenty of room for your ball to find it. 2. In addition to numerous water hazards and bunkers, it’s easy to get stymied by overhanging trees at Harbour Town, even when you hit the fairway. How can you achieve maximum trajectory to clear such obstacles, and can you use the technique with any club in the bag? Manzella: You need two things to hit it high: loft and a shallow angle of attack, meaning catching the ball just before or even after the low point in your swing. To get both, start the process of lining the club up for impact with plenty loft around the time your lead arm is parallel on the downswing. Also, get your lead shoulder as far away from the ball as you can at impact. Oh…and finish high! It works with EVERY club in the bag. Plecker: Hybrids are an essential piece of equipment for golfers looking to launch their shots and land softly. I fit many golfers into 21- to 24-degree lofted hybrids with lightweight shafts (which also help to increase spin rates) for more ball speed and launch. These clubs replace traditional low irons and are so much easier to launch high from fairway and rough alike. Today's newer hybrid heads work better than low irons due to the “trampoline effect” of the club face. This actually springs the ball off the clubhead faster than it would with an iron—more ball speed and proper spin rates are essential for higher shots. The average player I fit for clubs will rarely use anything lower than a 5-iron and play hybrids to carry their long shots higher onto greens. -Play the ball position slightly more forward in the stance. This will position the ball in front of your head at address and create a small tilt in the upper body away from the target. -Narrow the width of your stance. Rotation in the lower body helps add loft, and one of the easiest ways to create more turn through impact is to narrow the stance. -In the fairways, think “sweep” not “steep” when launching your shot. Using a lofted hybrid with a lighter shaft and these swing thoughts will get the ball higher. Riggs: Producing high-launch shots requires some common sense from a strategic standpoint. A good rule of thumb is to pick the club you are confident you can get up and over the obstacle then choose the next most lofted club for insurance. This guarantees you will avoid the worst-case scenario of hitting the tree and ricocheting into more trouble. While taking more loft may not reach the green, it will get over and give you an opportunity to get up and down. -Play the ball forward from the normal ball position. -Add a little speed to your swing. The faster you swing, the more spin you can impart on the ball. More spin causes the ball to climb higher. -To see if you have enough loft to hit the ball over something, lay the club on the ground with the grip end pointing at the object you're hitting over. On the club face, you will see the potential launch angle of the club. Mogg: Harbour Town calls for curving the ball on tight trajectories, being able to start it on a tight line then letting it move slightly. To do this, you have to be able to get the ball started on the correct line, focusing on a small object like a leaf or colored spot ahead of your ball. Make sure that you are firm down and through impact to get it started on line, as this is the first obstacle to ensure you don't hit any tree branches. 3. No. 18 is one of the most visually intimidating holes on Tour, with water left and OB right. What’s your best advice for how to tackle shots that make you feel a bit weak in the knees? Mogg: No. 18 is visually intimidating but one of the easiest driving holes on Tour, as it's so wide. Part of the trick on tough tee shots is to see the hole for how wide it really is and how much you can “miss” it, and still be okay. Best advice is to get specific with your target and really commit to hitting it where you have chosen. 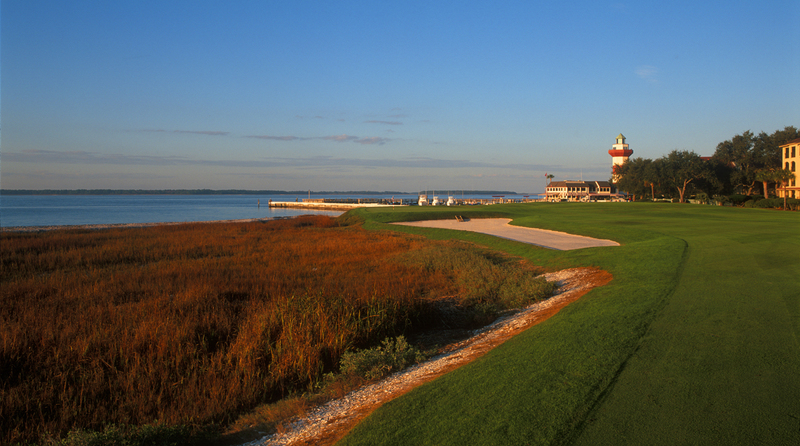 Good decisions are everything at a course like Harbour Town, and especially for the second shot at 18, where the green is so small and the dangers are near the green. Riggs: There are always holes on a golf course that can give players trouble, especially if they fall for the course designer's tricks. The 18th at Harbor Town is much wider than it looks from the tee. This is much easier to see when looking at the hole from the green back to the tee box. When a difficult hole messes with your confidence, changing your perspective of the hole, especially during your practice round, is a great way to remove some trepidation. Once you see the hole from a different angle, some of the unwarranted fear will go away. Manzella: Take a deep breath and a couple of soft practice swings. Over the ball, after you know you've set up correctly at the target, focus on your little area where you stand and address the ball—it's same space on every practice shot you ever hit. Now, pull the trigger and DON'T RUSH any part of the swing. Try to duplicate the FEEL of the best shots you hit just like THIS one! -Visualize the shot you want to hit, make it your most reliable shot. You can even visualize a shot similar to a shot you hit on a previous hole, or on the range. Get a good mental picture. -Focus on what you want to do as opposed to what you don't want to do. -Use your normal routine. Give this shot the same attention as any other shot. -Make an aggressive swing, It's never a good idea to swing easy under pressure. Plecker: I've never played that hole, but know the feeling! If you are feeling weak in the knees, you are experiencing a normal reaction to stress. It's called “fight or flight!” It's normal to want to rush the routine and hit quickly just to get out of the uncomfortable situation you are facing, or have too much adrenaline while making a swing. My advice? Stop, breathe and look around. Enjoy the moment! You earned the right to be in this epic golf experience, staring down a famous hole with something riding on the match, so enjoy every second of it! Next, take a few deep breaths from the belly. When you breathe, you slow your heart rate down. This, in turn, will allow your eyes to find a spot for the shot to finish. Trace that line back to your ball using your preferred shot shape. Most importantly, lock in on the direction the ball needs to start off the club face. Follow your routine and keep the starting direction of the shot as the only thought in your mind while you swing.